The Twins are reportedly interested in J.A. Happ, which may or not really mean anything at all. We can assume the Twins are interested in a lot of guys, right? Welcome to the offseason! What are your thoughts on J.A. Happ? Happ has been a great starting pitcher over the past four seasons, posting a 3.48 ERA (121 ERA+) and 1.21 WHIP for the Mariners, Pirates, Blue Jays and Yankees. The problem is that means he’s good enough to command a multi-year deal, though he’s already 36-years-old. The Twins could use a left-handed starting pitcher, and Happ would also add some experience and leadership. 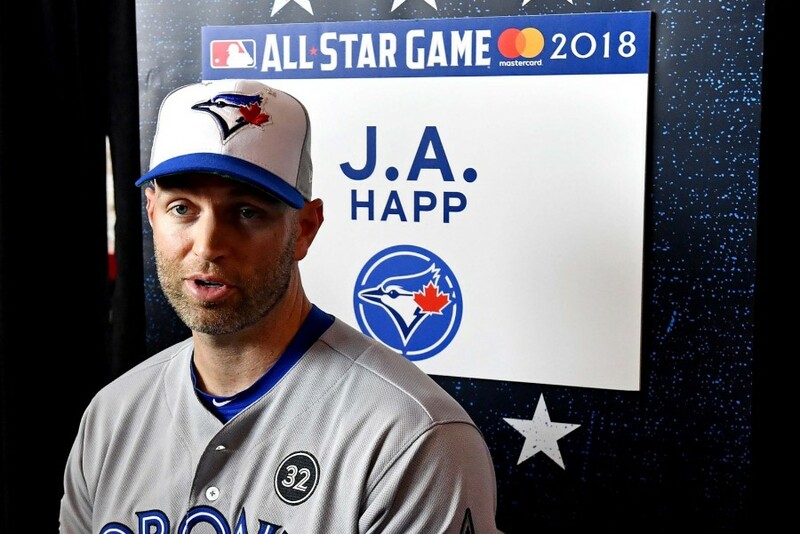 MLB Trade Rumors had Happ has their No. 9 free agent and predicted he'll receive a three-year, $48 million deal (from the Angels) while FanGraphs had him ranked 21st and projected a two-year $28 million. There were some rumblings of a Seattle fire sale brewing, but GM Jerry Dipoto downplayed that possibility, telling MLB.com “we're not looking to rip our club down. We're just too talented to do that.” Dipoto being Dipoto, he went ahead and made a deal tonight, sending catcher Mike Zunino to Tampa Bay for outfielder Mallex Smith. This is a situation worth keeping an eye on, a the M’s have pieces on their pitching staff and infield that could represent upgrades for the Twins. High-profile agent Scott Boras name dropped the Twins, and not in a favorable manner. OK. The Twins are a lower-market payroll team and attendance isn’t booming, but of all the teams you’re gonna take a cheap shot at Minnesota? Really? Per USA Today, the Twins had the 16th-highest Opening Day payroll and per ESPN they were 20th in attendance. Maybe Scott should stick to marketing his clients instead of shooting off super lame jokes. Of course, it’s when his clients arrive when Twins fans are really gonna show up. Earlier this week, Nick shared his offseason blueprint that envisioned the Twins as big spenders. The site has been booming with blueprints, as both the forums and the blog section have been active. Grab a copy of the Offseason Handbook for whatever price you feel is appropriate and put together your own blueprint today. Matt Eddy of Baseball America shared a list of 520 minor league free agents. One name that really jumped out to me was Dilson Herrera. He’s a 24-year-old second baseman who has some MLB time (108 games) with the Mets and Reds. Herrera has a .290/.349/.461 (.809 OPS) batting line in 1,305 plate appearances in Triple A. The Twins will certainly aim higher in their search for a second baseman, but Herrera is an interesting fallback option. Dan Hayes of The Athletic reported that it won’t be too long before the Twins hear final word on Joe Mauer’s future. Also over at The Athletic, Jim Bowdenshared five potential landing spots for J.T. Realmuto, should the Marlins decide to deal him. Spoiler alert! Twins are not listed. Kennys Vargas signed with Japan’s Chiba Lotte Marines. No disagreement here, MIke. My response was targeted specifically at our inability to draft, trade for, and develop SP which is an entirely different point. We need to develop more than one good SP per decade. Harper had one huge year four years ago(2015) with a WAR of 9.3. Since then he has been good but not great and $300M was not enough? Finding $5M FAs that produce 2 WAR is a lot more important than signing guys that average 3.5 for $35M/year. Is WAR really that great of a stat? I have a really hard time believing that whatever contributions Dozier and Segura make defensively and on the base paths makes up for that big of a gap in overall offensive production. Many years I'd agree with you, but I don't think 2019 is such a season. 2 WAR is pretty close to the definition of "average major leaguer". If that's all you're aiming for, and you don't have some superior players already on the roster, you're not really contending, you're just average. Business analytics people at airlines and oil firms and forestry companies understand that when you have a constrained system, it may be difficult to anticipate exactly which constraints will be binding and which will be slack. Learning which, will tell you how to proceed with your strategic planning. On a baseball team, among the most crucial constraints are the 25-man roster (you can't win a pennant by using 100 cheap 1-WAR players), the 40-man roster (ditto), and your budget. Right now, we have very little likelihood of exceeding the budget until we sign some new players. Given a lot of potentially average players on board right now, at low cost, it makes sense to sign a few high-WAR potential players, even if the price-performance isn't good. If you're in the habit of assuming that budget will always be the binding constraint at the very outset, you'll miss opportunities. There's a difference between efficiency and effectiveness. With all our cost-efficient youngsters, I want to focus on effectiveness, for the few guys we do sign. I don't know right now that $35M for 3+ WAR isn't actually a pretty good deal for this present situation, unless you have a better way to acquire 3+ WAR. I was a bit taken aback that the Twins had fallen to 20th in attendance. Where they will end up after 2019 is...scary. That they are in the middle of the pack for payroll. Does the front office not realize that you spend money and put a team on the field and attendance likely will improve? Happily (but sadly) with Mauer gone and a house-cleaning continuing, the front office will be able to remake the team in their own image. Yes, the Twins CAN spend upwards of $150 million. They have to if they wish to remain competitive. Yes, the Twins WILL NOT spend that much money this season as the look once again at the longterm possibilities of Sano, Buxton, Kepler, although signing any of them longer term if you have faith in them producing average or above would be prime right now, a you might be able to get the bargain you wanted last season. The pain of Alex and Royce being Boras clients is that we will start hearing thoughts on "holding the players back" if either have a breakout minor league season again. An agent wants players to hit the majors as soon as possible and get that service time in and arbitration out of the way before they hit their 28th/29th year so the big money will happen. Actually, most are happy jut for the percentage of major league monies over minor league wealth. Do you mean like this guy Mike? Boras wasn't really picking on the Twins. He did a short bit where he told similar jokes about other teams. It's not a big deal. He was just warming up the crowd by telling baseball jokes that EVERYONE in the room could understand... Yes, anyone could have told that joke. Business analytics people at airlines and oil firms and forestry companies understand that when you have a constrained system, it may be difficult to anticipate exactly which constraints will be binding and which will be slack. Learning which, will tell you how to proceed with your strategic planning. On a baseball team, among the biggest constraints are the 25-man roster (you can't win a pennant by using 100 cheap 1-WAR players), the 40-man roster (ditto), and your budget. Right now, we have very little likelihood of exceeding the budget until we sign some new players. Given a lot of potentially average players on board right now, at low cost, it makes sense to sign a few high-WAR potential players, even if the price-performance isn't good. I also have no interest in winning the WAR/$ spent championship. I want to watch the Twins win the World Series championship. Now I won't have to fret any longer over how to pronounce "Kennys". Is the 's' silent? Do I say the 's'? So stressful. I hope the stress caused by the silent 's' isn't the only reason you're glad for the departure of Matt Belisle. Harper's ability to walk really pushes him up in those three categories. Let’s say we followed the wishes of many and signed Greinke 3 years ago. Add Mr. Popular (Marwin Gonzalez) and the RPs suggested by Lev. Here is what we can say for sure. Add roughly $65M annually which would max out payroll. In other words, we are not adding anyone for the next 3 years and we would have to replace Gibson at the cost of his final year of arbitration. Let’s use the last 3 years instead of last year because that’s more optimistic. Let’s assume Greinke does not regress even though that is not consistent with history. Let’s forget Gonzalez is basically replacing Escobar who had two war before the deadline and let’s pretend Greinke replaces a replacement level player even though I am pretty sure Mejia is worth at least 1 WAR. We have a 500 team under this generous scenario with no available payroll for the next 3 years. There is no scenario where paying 10M/WAR is effective. We would need to spend an incremental $200M to field a team reasonably close to the top AL teams. That is the definition of an ineffective plan. Actually, I can make-up a far fetched scenario where we have several prospects play at a very high level on costs controlled contracts and we add once such player. We are a VERY long way from that scenario right now. Another, perhaps simpler way to evaluate this specific year is that we are in need of several players. If we an incremental $70M on two high profile players we pick up 7 war and have some holes to fill. If we spend $35M on 7 players that generaten 2 WAR we pick up 14 (double) WAR and have $40M to spend next year. I think it's pretty clear which approach has more value to any team, especially a mid-market or small market team. Because they areelite prospects, service time will be a factor regardless of their agent of choice. This front office showed how much service time is a factor in September, so it's probably more about front offices than agents. No. It's quite suspect and I think that's the general feeling here but it still gets used often because of the summary nature of this measure. It also does not need to be precise in this context. Look down the list any year and the ranking by WAR looks pretty reasonable. In other words, it's hard to justify the gigantic cost and risk associated with this type of contract (see Heyward) for a player that has not ranked as elite in 4 years. The differences are Jason Heyward had a .784 OPS entering free agency (Harper is at .900) and Pujols didn't reach free agency until he was entering his age 31 season (Harper is entering his age 26 season). And while Harper's only had one insane MVP season, he's had several great seasons now. He's 26 and one of the best offensive weapons in baseball, he's going to get a gigantic contract, and deserving so. He is 21st in wRC+ for players with 1200+ ABs over the past 3 years. That's very good but $35M/year good? Daniel Murphy was 5 pts higher. Let’s say we followed the wishes of many and signed Greinke 3 years ago. Add Mr. Popular (Marwin Gonzalez) and the RPs suggested by Lev. I haven't done a plan yet, in part because I am discouraged about nearly all the possibilities I have looked into. (Our FO doesn't have that luxury of course!) But, I've stated elsewhere that I'm not enthused in the slightest about your Mr. Popular. Likewise, the slate of relievers isn't something I'm advocating. So you're replying to something else than I posted. Actually, I can make-up a far fetched scenario where we have several prospects play at a very high level on costs controlled contracts and we add once such player. We can't know what the conditions will be like next July. Even if low-probability, there is some chance that a successful young core will emerge where we'd be glad if we had acquired some additional high-end veteran talent when we had the chance. I don't see Greinke as low-risk, but Arizona has borne a lot of the risk already and he hasn't dropped off the cliff, and if they want to shed some salary he seems like a good target - in hopes they will cover $10M a year, leaving $25M, I'm not sure exactly where that can negotiation can go. Let's just say that I see nearly as much risk in Marwin, or in a lengthy Buxton extension that some propose, as Greinke. So why not aim high. You could fritter away the $25M or $35M I target for Greinke, on a group of lesser talents adding up to the same amount, and the risks for them will hardly be non-zero, plus taking up more 25-man spots. that's assuming Buxton and Sano aren't any better than last year......in which case no plan works. Has any team ever picked up 7 players in FA that did 2 WAR in that year? Did they then have to do it again the following year, because they signed a bunch of 1 year deals? Where, exactly, would you fit 7 new players on this roster? Who goes under this plan? A 26-year-old who can boast that resume should be able to command something like that on the open market, yes. You are making a different argument, Mike. The conversation was conceptual. I said its more important to find guys for $5M/yr that give you 2 WAR than it is to sign a 3.5 WAR guy for $35M. Any plan that produces 1WAR/$10M of payroll is self-defeating for any team other than the highest revenue teams. The Dodgers ? Yankees etc could easily add three such players in addition to the Twins available budget so it's a different equation for high revenue teams. The 7 players were simply a way to get to the same spend. If you prefer a more practical vs conceptual example. How about if we say we sign 3 FAs. One generates .5 WAR the other 2 produce 4 WAR. We have + 1WAR over the Grienke and $20M to spend next year or use for an extension or add two BP arms for $10M each. I'm all for them aiming at 4WAR players....those guys will cost in the 20MM per year range, maybe as low as 15MM per year. Corbin, who might produce that, will get around 25-30MM per year, I'd guess. When you go to a game in Anaheim, only St. Peter shows up. When you go to a game in Seattle, only Jacque Cousteau shows up. When you go to a game in Milwaukee, only Adolphus shows up. When you go to a game in Colorado, only Pike's Peak shows up. You're right, there is a lot of low hanging fruit there. Scott Boras is a great agent.That's all I have good to say. When you go to a game in Chicago, the fan is only wearing one sock. When you go to a game in Miami, not even Marlin Perkins is there. When you go to a game in Kansas City, only a Baron is there. When you go to a game in Tampa, they don't even need to recount the attendance. You're right, there is a lot of low hanging fruit dead branches there.